2016 was our first visit to the UKGB 2cv club in Chichester, were we met lots of people sharing our admiration of the tin snails, who literally adopted us into the 2cv family. So many people were saying they wanted to come to a National in Jersey that, once back on the Rock, I mentioned to my fellow club members that, perhaps we could…..
And we started the preparations, ideas flying everywhere, and then, a plan started to take shape, the preliminary inquiries and discussions lasted longer than a pachyderm gestation’s and 2 years later, we were expecting our first 2cv guests. Preparations were also made in France as Val from the Club du Mene, was regrouping all interested French clubs on the same ferry booking to take advantage of the group tariff. A special thank to her for arranging this. Sophie Pitman Illustration (leaflet and rally plaques designs) – Sophie now lives in London and accepts commissions if you are looking for something original. 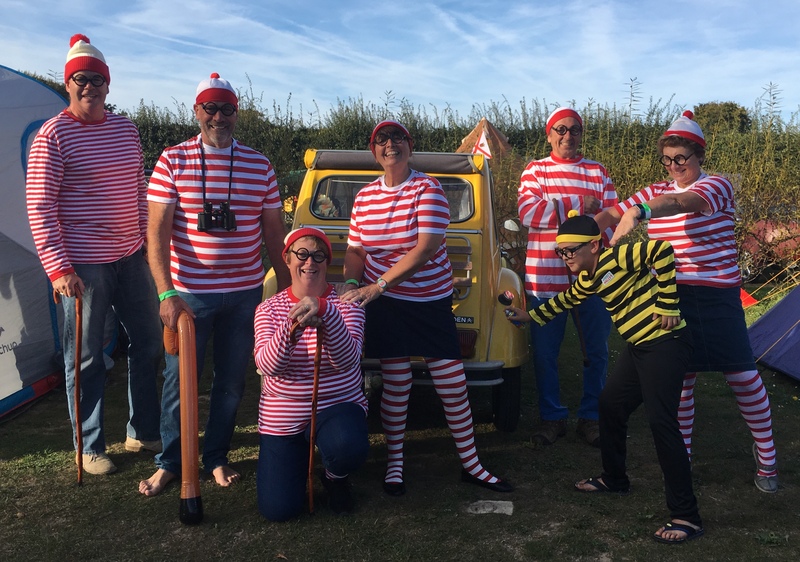 We definitively chose the right camp site, Beuvelande had all we needed, great facilities, plenty of room, lots of space to eat and of course, the quintessential bar and very helpful and friendly staff from start to finish. So we start with saying thank you to them for hosting & feeding us. People came trickling in a few days before the event, Helen, Debbie & Peter taking turns to wait for the them at the harbour to show them the way to the site. Friday saw the arrival of the majority of the cars, who were late thanks to the ferry’s late arrival and had to pitch up in the dark. It took a little while but then all tents where shaken out of their bags and erected, and everyone was checked in, and ready to socialise and make new friends. 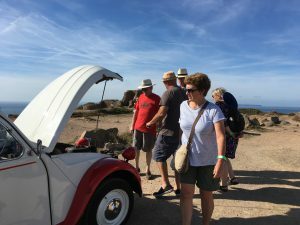 After a sketchy beginning (late opening of the restaurant for breakfast to the late arrival of the bread delivery) and a lively briefing by our route planners, the cars were lined up, maps distributed and let loose in Jersey nature led by our local club members. First stop, the Steam museum, followed by a lovely picnic stop at Reg’s garden, where our hungry revelers were able to find a place to sit and eat in a peaceful setting and meet the friendly owner Reg who went out of his way to make them feel welcome. Most of our visitors were amazed by the gardens and will remember as one of their highlight of the tour. Thank you so much Reg for receiving us, you were the perfect host. The route took the cars to Noirmont, Corbiere, five mile road (although the sprints forced a detour, how inconsiderate…), then en route to Battery Moltke for a visit and a drive to Grosnez, who turned out to be such a busy place, we were unable to park all 45 cars who had to go round the car park and stop outside the race course for the planned drone picture. I then had to leave the route as my Titinne had decided she had enough and had to be hot-wired to start and limp back to her garage. All came back to the campsite in good time to have a little rest before the “apero” were all were treated with either a glass of wine or a soft drink, nibbles were kindly bought with the voucher we had received from the Coop. And it soon was time to head to the restaurant for hot food, more drinks and music. Our compliments to the Chef for his menu, especially the fish and chips which were a hit with all nationalities present! The party lasted a while, with “Le club du bout du monde” singing at the table and shall I say it? A little bit of pants showing from one of their member! 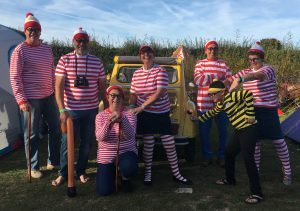 Not to forget the group of misfits dressed as “wallies” and other groups. All I could hear was the sound of the fiddle playing, and lots of laughter all round. Sunday morning arrived too quickly, I woke up early and took a walk at sunset through the camp, taking pictures of the cars and tents, all quiet apart from the occasional loud snoring coming from certain tents…. After a breakfast without incident, it was time to line up the cars again for a drive, being now car-less, I jumped into Buzz with Chris and we set off last, to sweep up any stragglers and help lost cars to find their ways, and offer mechanical help (Chris, not me) when the cars were in trouble. The main stop was on the Green in Gorey where we all stopped for picnic, and said good bye to those who needed to head straight for the ferry. Well it wouldn’t be a 2cv week end without a drama or 2, or 3, Titinne started with sticking her key in the starting position, over working the starter motor and having to be hot wired (thank you Ian for rescuing me when my hubby was elsewhere). One of the van’s fuel pipe decided to disconnect itself and spread fuel all over its engine and saturating its insulation. 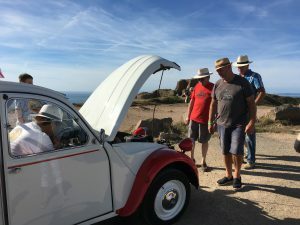 One of the french car developed starting problems and then conked out in a bend on Rozel Hill, Chris came to the rescue and after a spark plug change everyone was back on the road. 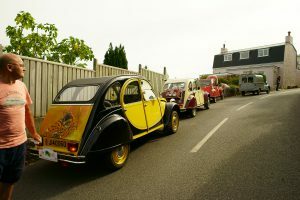 So no major casualties over the week end, however, I have had the opportunity to confirm my theory that each 2cv in distress is a “man trap”, since as soon a the bonnet of a 2cv opens men rush to it like moths to the flame, so my advice to all single ladies out there looking for Mr Right; get a 2cv, open the bonnet, and emulate Miss Penelope Pittstop from the Wacky Races (for those of you too young to remember, stand helplessly next to the car, put a hand on your brow and yell faintly : ” Help, I’m it trouble”), I can guarantee you that this work having tried it myself this week end. 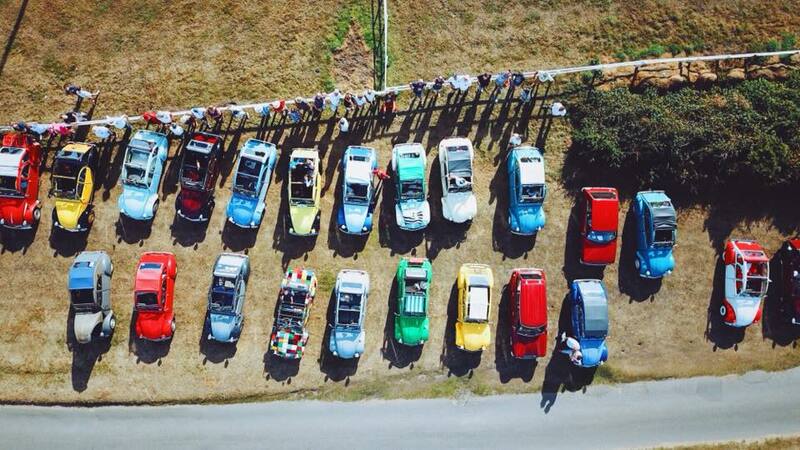 Please feel free to share your experiences of the week end in the comments, we would love to hear from you.